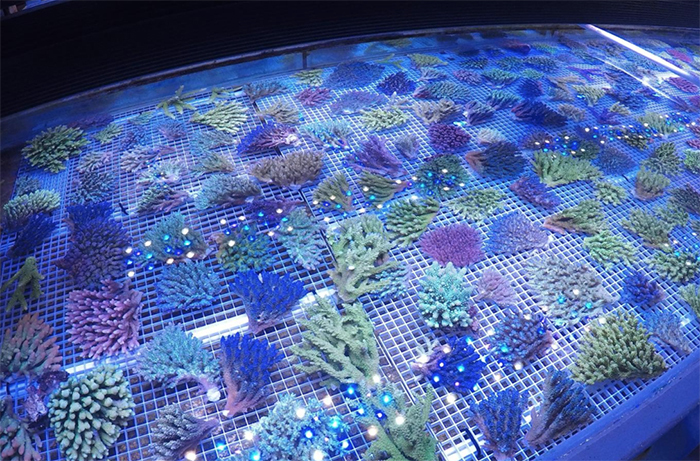 Reef aquarium containing wild collected, maricultured, and aquacultured coral. Photo by Austin Lefevre. As a professional aquarist, this is something I hear every day. Looking from an outsider’s point of view, I have to agree with most of these comments. These days it is not uncommon to find several coral frags at vendors that are worth more than their weight in gold. Why is this? Where does this come from? Is the reef keeping hobby even for me and my family? Section of “Pratt Reef”, run by the editor of Reefs Magazine, Randy Donowitz. Photo by Randy Donowitz. While there are various reasons for high costs that we will explore later, first I would like to identify a trend I’ve seen grow more than I could’ve ever imagined in my thirteen years as an industry professional. These are the hobbies within this hobby, in this case, “coral collectors”. At some point in time, there was a drastic shift from simply getting the most colorful corals you can find, to getting the industry’s most coveted named coral morph while tracing lineage like a pure-bred dog. The latter is how I define a coral collector. There is nothing wrong with being a coral collector, or desiring the latest and greatest coral release from a vendor, it is just as much a thrill as getting coral to grow for many amazing aquarists! However, I highly recommend all beginner reef keepers to wholly avoid any temptation of the gotta catch ’em all mentality. 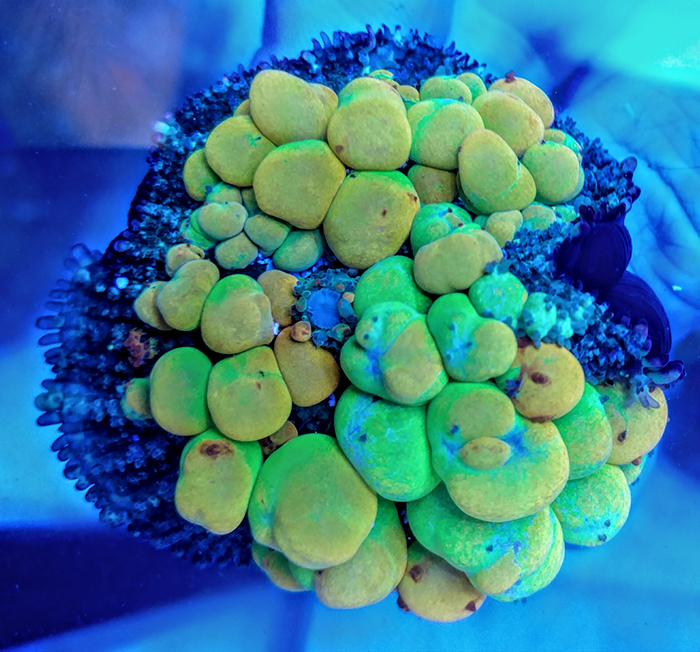 Infamous World Wide Corals bounce mushroom. Photo by Austin Lefevre. Industry media contributes to hobbyist’s desire for the latest coral trend, mushrooms polyps are a good current example. Years ago I worked at an aquaculture facility that utilized natural sunlight, and during summer months hundreds of mushroom morphs would develop bubbles on their polyp. This is a result of U/V poisoning. This occurs due to their lack of mycosporine-like amino acid production, and their symbiotic zooxanthellae’s inability to produce xanthophylls (Baker and Rowan 1997). In layman’s terms, they cannot produce a natural sunscreen, so they bubble. After one of these morphs asexually propagated (or was forcefully propagated) in someone’s reef, this trait surprisingly carried on to frags. The ability to force bubbling was seen later as people blasted mushroom polyps with light prior to selling (https://reefbuilders.com/2016/02/09/before-they-were-bounce-shrooms/). Today one of the most popular corals in the trade is a sunburnt coral that has sunburnt babies too. Crazy, right? The point being, don’t burn yourself out, new aquarists should avoid the flavor of the year coral trend. If you really want something, wait it out. Prices will come down or your reefer budget will increase once you’ve stocked your aquarium with other stunningly beautiful animals minus the Fifth Avenue price tag. Many vendors offer a vast array of coral from fast growing soft coral with basic color morphs, up to those that vie for their value in weight with gold. Some offer wild colonies, some offer maricultured colonies, some offer aquacultured fragments, while most offer all of the above. What are the differences? More importantly, what’s the best choice for you? Wild Acropora colonies settling in after collection prior to shipment at Cairns Marine. Photo by Cairns Marine. Wild colonies are pretty self-explanatory. They are chunks taken from a large colony on a natural reef, or sometimes the entire colony itself. Of course, these corals have adapted to life in their specific locale, including water parameters, light, and flow. Often times they require time to recover from handling during collection and shipping and should be afforded that to adapt to captive conditions. Be wary of any vendor who brings in a shipment and advertises new animals for sale shortly thereafter, as obviously they have been provided little to no recovery time. Wild colonies can also bring with them every coral pest under the sun, so having a thorough dip routine, quarantine system, and fragging tools to remove unwanted pests should be an absolute priority when considering wild colonies. Maricultured coral growing out in Pulau Serangan. Photo by Coral Morphologic. Maricultured colonies originate from small fragments removed from a wild colony. These fragments are placed in designated areas in the ocean leased by mariculture farmers to grow out to sellable sizes. Most mariculture farmers will get a few generations growing prior to selling any in order to keep a consistent supply on hand. Maricultured pieces have grown in leaps and bounds compared to years past, with farmers targeting the brightest color morphs and honing their algae and pest removal skills prior to shipping out. Yes, since these are grown in the wild they are susceptible to bringing in coral pests just like wild colonies and should be treated the same. However, I believe these are a great option for aquarists who want to start with some larger pieces right off the bat as they tend to fair better than their fellow wild collected coral. A great vendor will let maricultured pieces settle in, and run them through a thorough dip regimen prior to offering for sale. Aquacultured Acropora fragments, healed and ready for shipment at Cherry Corals. Photo by Cherry Corals. Aquacultured fragments are originally taken from either of the above, but given time to grow out and heal in captive conditions. Many aquaculturists goal is to produce several generations of these frags prior to selling, which effectively leaves any trace of their ocean-grown counterparts behind. A fully captive grown fragment is going to be the best choice for novice and expert aquarists alike, as it has already been converted to home aquarium conditions. 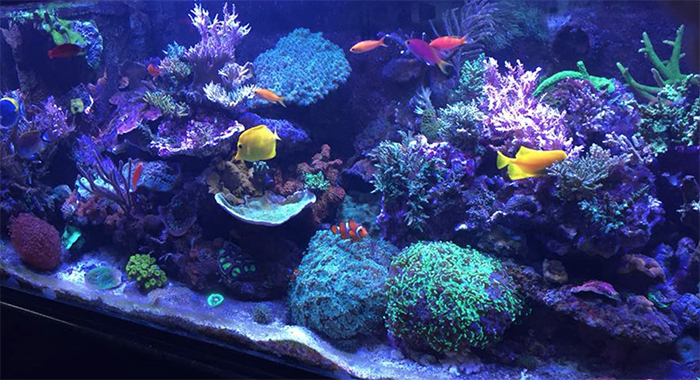 Growing these corals out and absorbing any losses along the way takes time, patience and a lot of work. In other words, it takes money, which is passed onto the consumer if a vendor wishes to make a viable business out of it. This generally leads to true aquacultured frags commanding the highest price tag, but not always. Unfortunately, coral pests can be very sneaky little critters, even residing within the coral mouth, so aquacultured coral should also be dipped and quarantined where possible to reduce the risk of infecting existing animals. With that said you might find one or two flatworms on an unlucky aquacultured piece, where I’ve seen wild and maricultured colonies produce “snow” after going into a dip, formed by thousands of flatworms falling off one fist sized colony. So how does this translate into your cost? With many aquaculture farms growing coral at breakneck speeds, a 2″ frag of “green bali slimer acro” would likely sell for $50. A maricultured 4″ piece would be about the same, where $50 for a wild collected piece could fetch you a multi-branched fist size colony. The latter two would take some time to condition once in your care, and would undoubtedly come in with some type of pest. This requires more work on your end to get a thriving coral growing when opting for the ocean grown corals, but the upside is a lower price point. The choice is yours. As with any industry, unfortunately, there are those who will price gouge. This practice is generally fairly easy to spot, where seemingly insanely high prices are asked for a newly imported coral that might be the first color morph of a particular species. So, simply avoid them, leave them for the die hard collectors. If I know anything for sure from my time in this industry, it’s that rarely if ever will there be a species, or color morph, only available once. They will be back, in greater numbers, at lower prices, especially once the collector/farmer catches wind of how much the original animal(s) sold for (social media has made sure of that!). 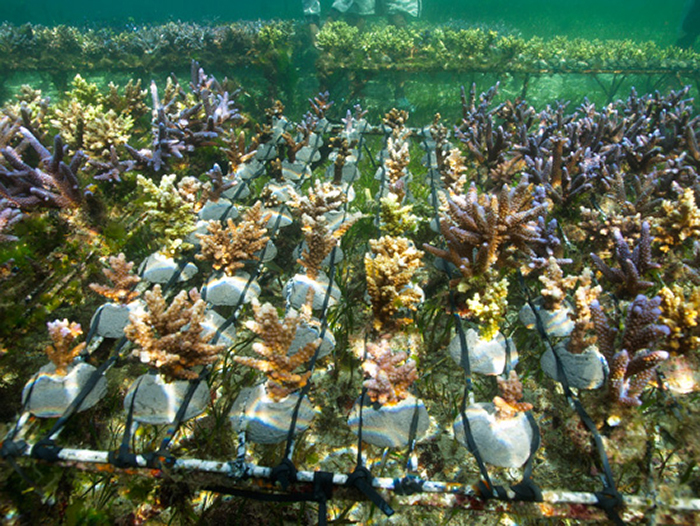 Raceway designated for growing Acropora fragments at Cherry Corals. Photo by Austin Lefevre. Ultimately supply and demand will determine the price for everything. It’s important for those newer to the hobby to know that supply of various brightly colored coral littering the internet is dwarfed compared to the enormous amount of brown-ish, green-ish, and dull colored corals, so they will always afford a higher price point than their muted relatives. For the beginner, however, cutting your teeth on more modestly priced and slightly less gaudy corals will serve you well as a hobbyist who is in it for the long-haul. 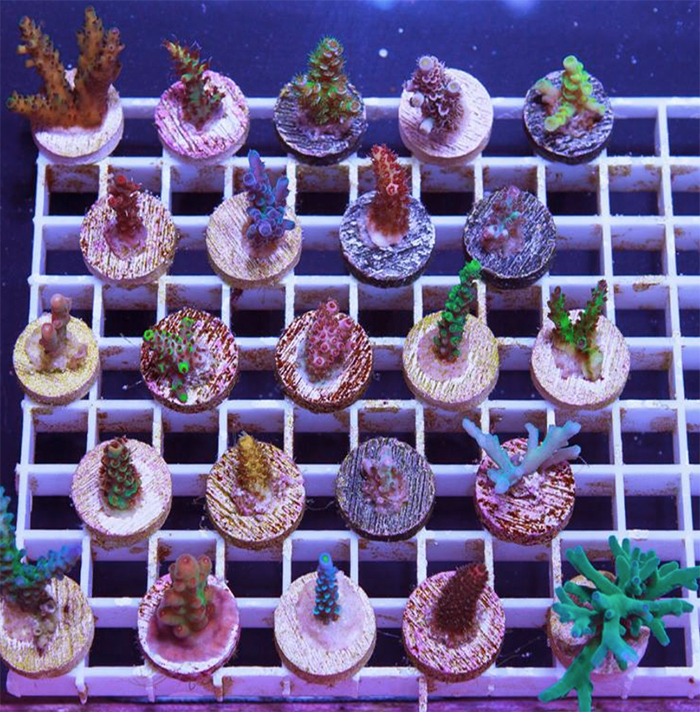 Once you’re ready for coral, find yourself a reputable vendor who not only provides amazing coral but has the knowledge and means to continuously improve your reef keeping skills. Happy reefing!